The Round Lake Area Exchange Club and sponsor, Savory Spice Shop Libertyville, are proud to announce the September Hometown Hero, U.S. Army Sergeant Matt Pirrello originally from Long Island, NY. He was registered for this honor by another Hometown Hero, SSg. Jonathan Boldt of Libertyville. 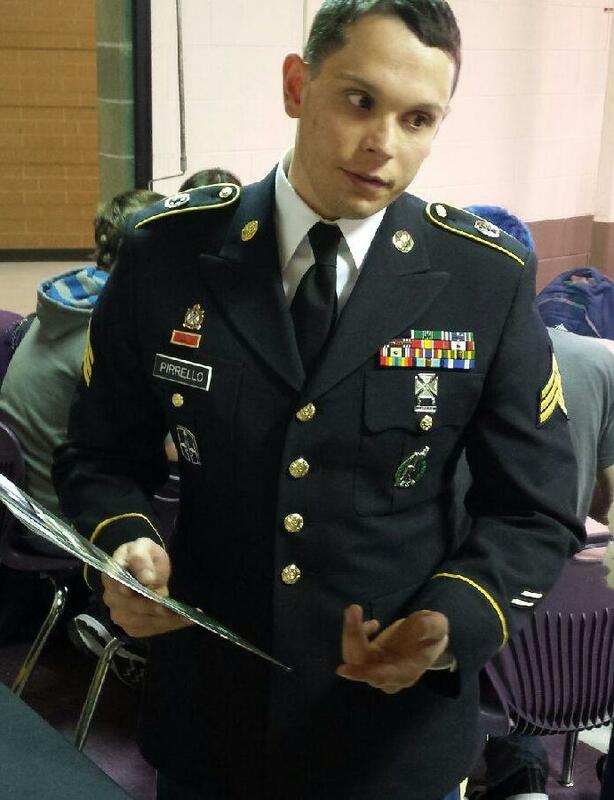 Pirrello has served in the Army for 7 years and has been awarded many honors and medals, some of which are; 3 Army Commendation Medals, 4 Army Achievement Medals, Good Conduct Medals, Iraqi Campaign Medal and Afghanistan Campaign Medal. He served as a Land Combat Electronic Missile Systems Maintainer and currently is a Recruiter in the Round Lake Beach Recruiting Office. Pirrello and his wife, Stephanie along with their son, Nathan call Lake Villa home. With the generous support of this month’s sponsor, Savory Spice Shop Libertyville, Pirrello’s “Hanging with the Heroes” care package will include a Chili’s gift card, a personalized “Hanging with the Heroes” t-shirt (donated by Artrageous of Hainesville) and letters from Round Lake School District 116 students. The Hometown Hero website is managed by Fokoz Creative Group of Grayslake. The Round Lake Area Exchange Club will present a plaque on his behalf Wednesday, September 23, at their meeting in Round Lake. The Round Lake Area Exchange Club needs your help in getting our local heroes signed up. Any and all military personnel serving overseas or in the USA from any of the Round Lake Areas, Hainesville, Fox Lake, Ingleside or surrounding areas qualify for the program. You can register your loved ones by going to www.rlaexchange.org/hero, five minutes is all it takes. For more information visit the web site or you can contact the program chair Sherry Ridge at 847-740-2379.